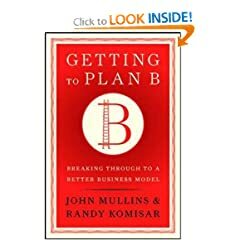 Just finished reading this book by John Mullins and Randy Komisar. It outlines the importance of iterating on the business to evolve the plan continuously – in many cases, the initial plan that entrepreneurs start with doesn’t work as it is. This is something that people in the venture space have known intuitively. John and Randy do a good job of motivating it with examples, and outlining a broad framework of what to watch out for. In some sense, the book is broader than just getting to Plan B – the initial portions on analogs and antilogs (as ways to find patterns that can fit your business) could be an independent topic. The degree of discipline that the book brings to those is limited, in that its a matter of judgment as to which analogs and antilogs one must choose out of many that are available – hindsight (as in case of many examples in the book) make it obvious, but thats not of much use when planning a business. Similarly, many case examples, such as Apple, are really about how a business will need to evolve even after it is successful (diversification, if you will). The portions of the book I found most interesting are the ones that genuinely outline examples of companies that learnt somthing important along the way that significantly altered their plan along the same line of business. Examples like African Leadership Academy, or Shanda. From an operating discipline standpoint, I wholeheartedly agree with the approach to define dashboards, keep listening to the data, and continuously refine the model. Global Giving seems to be a great example of where this was done systematically. In some of the companies I have been involved with, the same approach has helped us make shifts sooner than would be obvious if the dashboards were not as explicit. The importance of dashboards and thinking upfront about risks is also interesting because in most cases the Plan B can not be preconceived – there is inherent risk in startups. Many examples in the book illustrate this – Silverglide, Google, Pantaloon, amongst others. Hence the process becomes more important than the content. Overall a great job. In the middle, the book deviates into a primer on startup financials which could have been skipped here. I want to buy “GETTING TO PLAN B”. i am from Mumbai, from where I can get the book. I moved to plan B (a different startup) as plan A (the original startup, both bootstrapped), now the sales is better..So moving to plan A too which is premium services.